A few years ago, we ventured out to make wine vinegar using the centuries-old Orleans Method perfected over 500 years ago in France. Most vinegar today is produced by a system that takes just hours, but removes most of the taste and the nutrients, and the 'art' of making this ancient elixir. In contrast, authentic barrel aged vinegar like ours is converted slowly over many months from quality wines and fermented juices with the starter - the 'mother' - in oak barrels. This is the way we do it in our 1865 Suisun Valley Vinegar House, and the result is a complex, rich elixir with fine balance and subtle complexity. Agrodolce in Italian means "sweet and sour." 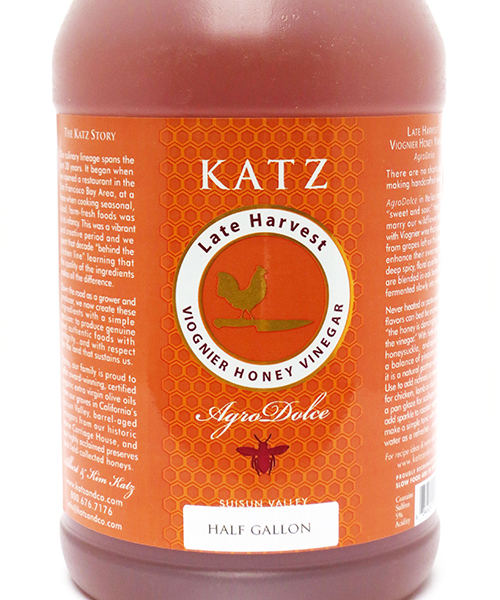 Here, we marry our own KATZ Varietal Honey with late harvest Viognier wine that is crafted from grapes left on the vine to enhance their sweetness and deep spicy, floral qualities. They then are blended together in oak barrels and slowly fermented into finished Agrodolce vinegar. The Viognier grape is native to the Rhone region of France. Known for its soft fruity and floral characteristics, it has 'transplanted' well to the limestone and clay soils of the North Coast growing region of California. The taste profile of "peach" and "apricot" is a perfect marriage for sweet, floral notes of honey. Never heated or pasteurized, and only lightly filtered, the flavors can best be expressed as the "honey is dancing on top of the vinegar." With hints of honeysuckle, vanilla and apricot balancing out the pleasant acidity, it is a natural partner with food.